Well, obviously he is a non-Catholic and told him that I concur that faith in Jesus is necessary for salvation…but differing from his view and non-Catholic interpretation and hermeneutics, I answered that it has to be an OPERATIVE FAITH, A FAITH SHOWN IN WORKS (Had he only read the book of St. James…which I hope is included in his bible for Luther didn’t consider it canonical as it goes against his thesis of sola fides, aside from sola Scriptura, and had it removed from the original Catholic biblical canon from which our other Christian brothers derived their bible). 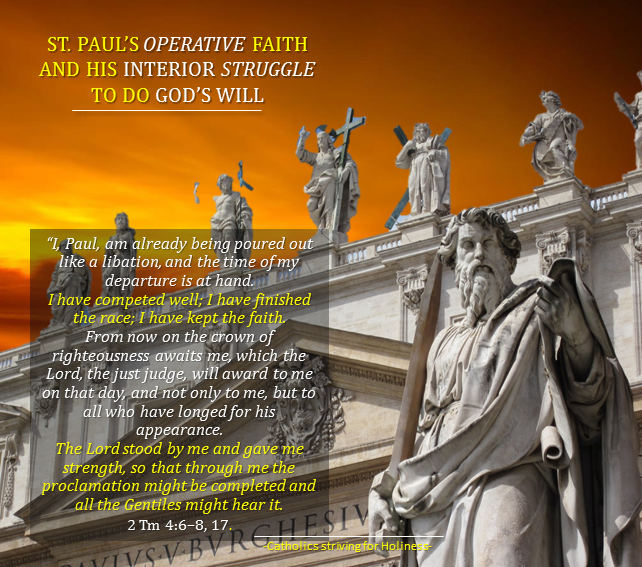 Moreover, ST. PAUL HIMSELF HAD TO STRUGGLE IN ORDER TO DO GOD’S WILL! In the 2nd reading of today’s solemnity when the entire Catholic Church celebrates Sts. Peter and Paul, I cannot help but meditate on it where St. Paul recounts how he “competed” and “finished the race,” i.e., the vocation he had received from Our Lord to preach to all the Gentiles, a task which he carried out with a passionate zeal to preach the Good news, after realizing that his life in and for Christ is all that really matters and everything else he considers as rubbish. “I, Paul, am already being poured out like a libation, and the time of my departure is at hand. I have competed well; I have finished the race; I have kept the faith. From now on the crown of righteousness awaits me, which the Lord, the just judge, will award to me on that day, and not only to me, but to all who have longed for his appearance. All these, St. Paul willingly fulfilled, without worrying about the tribulations, dangers, sufferings, apparent failures that may assail him coupled with the interior difficulties he had to confront, that “old man” who pulls him away from what he knew he had to do, that “law” in his members which alienates him from doing what he saw was right, from doing God’s will. My point is: St. Paul had to struggle with all these! He knows that faith in Jesus Christ is what justifies us but he does not ignore the necessity of interior struggle in order to “complete the race” and receive the “crown of righteousness”. But in order for us to really believe and to really love, day in and day out, we have to struggle to correspond to God’s grace in order to overcome the old man, the law in our members which separates us from doing God’s will, our vocation to holiness and apostolate and to acquire the necessary virtues with God’s grace and this requires struggle on our part. We cannot stay still. We must keep going ahead toward the goal st. Paul marks out: “It is not I who live, it is Christ that lives in me.” This is a high and very noble ambition, this identification with Christ, this holiness. But there is no other way if we are to be consistent with the divine life God has sown in our souls in baptism. To advance we must progress in holiness. Shying away from holiness implies refusing our Christian life its natural growth. The fire of God’s love needs to be fed. It must grow each day, gathering strength in our soul; and a fire is maintained by burning more things. If we don’t feed it, it may die. Remember what st Augustine said: “If you say ‘enough,’ you are lost. Go further, keep going. Don’t stay in the same place, don’t go back, don’t go off the road.” … Am I advancing in my faithfulness to christ, in my desire for holiness, in a generous apostolate in my daily life, in my ordinary work among my colleagues? St. Josemaria, “Christ is Passing By,” n. 58.